Molly arrived on Thursday 8th December 2016. Went to her new home on Saturday 24th December 2016. 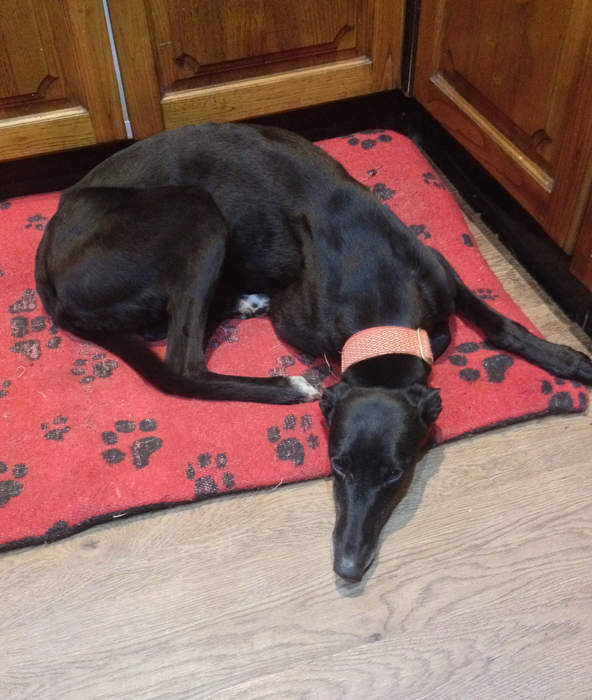 Molly is a small black ex-racing greyhound who is spayed, inoculated and microchipped. She is cat trainable, walks lovely on a lead and travels well in a car. The person we brought Molly here for thought she was too old so we are on the look out for someone else to adopt her. A couple who adopted Delilah were looking for a companion for her so they took Molly to see how the two of them got on. 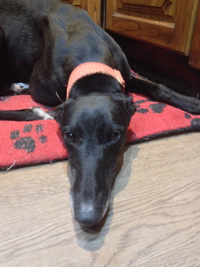 We heard today Delilah's owners thought the two of them are brilliant! They've had a play in the garden, at first Molly was a bit unsure when lilah started barking, but pretty quickly she just started joined in. They say they are so funny!! 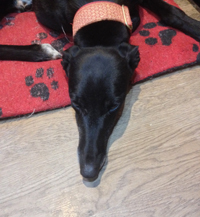 Don't want to speak too soon but they think Molly will be staying!